Background: Diabetes type 1 has a variety of destructive effects on different parts of the body including kidney tissue. Diabetic nephropathy is among the serious complications of diabetes. Oxidative stress plays a central role in the development of diabetic nephropathy with glomeruli dilation. Objectives: Due to the known anti-oxidant and anti-diabetic effects of Origanum majorana (OM), this study was conducted to survey its effects on oxidative stress and histopathology of renal tissue among diabetic rats. 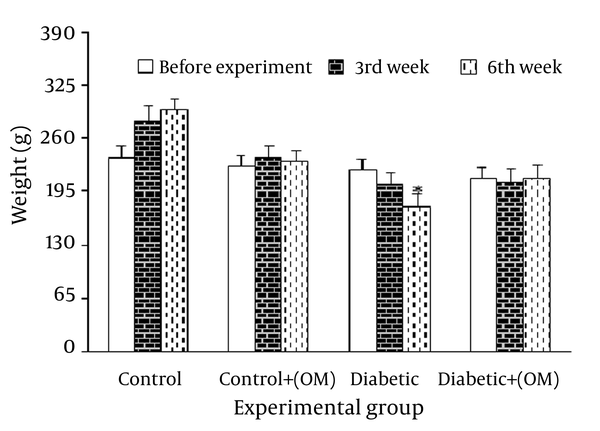 Materials and Methods: In this experimental investigation, 32 male rats, weighing 200 - 250 g, were divided into four groups: 1: control, 2: control receiving treatment with OM, 3: diabetic, and 4: diabetic receiving treatment with OM. Diabetes was induced by intraperitoneal injection of streptozotocin (60 mg/kg). Groups under treatment received food containing 6.25% of OM. Tissue levels of malondialdehyde (MDA) were measured to evaluate the oxidative stress. In addition, renal histopathology was evaluated using hematoxylin and eosin (H & E) staining. Data were analyzed using ANOVA. Results: A significant increase in the renal tissue level of MDA was observed in diabetic and OM-treated diabetic groups versus control group (P = 0.01 and P = 0.04, respectively). OM treatment non-significantly reduced the tissue level of MDA (P = 0.11). Also, diabetes caused a significant increase in glomerular size compared to the control group (P = 0.03), and treatment of diabetic rats with OM caused a non-significant decrease in glomerular size compared to the diabetic group (P = 0.17). Conclusion: Taken together, long term treatment of diabetic rats with OM can partially protect the renal tissue via attenuation of oxidative stress and glomerular expansion. Diabetes mellitus is a metabolic disorder with chronic hyperglycemia and defects in carbohydrates, lipids and proteins metabolism (1). Chronic diabetes can lead to retinopathy, nephropathy and cardiovascular disorders. According to some reports, diabetes prevalence is increasing worldwide (2-4). Presumably, one third to half of diabetic patients will finally develop diabetic nephropathy which is the most important cause of morbidity and mortality among diabetics. Mortality rate among patients with diabetic nephropathy is 30 times more than diabetic patients without nephropathy (5). Diabetes mellitus also has a close relation with oxidative stress due to the increased formation of oxygen free radicals. Different studies have shown that hyperglycemia is related to increased oxidative stress. Increased oxidative stress has a pivotal role in the renal damage of patients with diabetes (6-8). Increased tissue level of malondialdehyde (MDA) is one of the important markers of oxidative stress (8, 9). Moreover, one of the complications of diabetic nephropathy is distention and destruction of glomeruli in the renal tissue (10). Because of the low accessibility and high expenses of most of the new therapies, finding new agents with less side effects such as herbal derivatives is further highlighted (11). One of these herbal plants is Organium vulgarea ssp. viridie (Origanum majorana). Investigations have shown that Origanum majorana (OM) can decrease blood glucose level in diabetic rats (12). Also its long term prescription hampered streptozotocin-induced diabetes tissue injuries (13). OM supplement is a modulator of tissue lipid peroxidation and is considered as an anti-oxidant in colon cancer with probable anti-cancer effects (14). With an increase in predisposing factors like obesity, sedentary life style, low body movements and inappropriate diets, a precise programming seems essential to manage the disease (15, 16). Due to the known anti-oxidant and anti-diabetic properties of this herb, we conducted this study to investigate the effects of Origanum majorana on renal histopathology and oxidative stress in diabetic rats. The plant leaves were prepared and the identification was approved by Shahid Beheshti University of Medical Sciences Biology Department. Leaves were grinded. Then the powder was mixed with the standard rats’ food with a proportion of 6.25%. Adequate water was added to the mixture and the pasta was formed in a shape available for consumption. Then it was dried for 24 hours with sunlight, and was provided in cages with water without any limitation. Rats were anesthetized with diethyl ether (100 mg/kg) (Merck, Germany), decapitated, kidneys were removed, blotted dry, weighed, then made into 5% tissue homogenate in ice-cold 0.9% saline solution, centrifuged (1000 × g, 4ºC, 10 min), and obtained supernatant was liquated and stored at -80°C until assayed. In order to measure the MDA concentration (thiobarbituric acid reactive substances, TBARS) in the supernatant, trichloroacetic acid and TBARS reagent were added to the supernatant, then mixed and incubated at 100ºC for 80 min. After cooling on ice, samples were centrifuged at 1000 × g for 10 min and the absorbance of the supernatant was read at 532 nm. TBARS results were expressed as MDA equivalents using tetraethoxypropane as standard (17). The protein content of the supernatant was measured with Bradford method using bovine serum albumin (Sigma Chemical, St. Louis, MO) as the standard (Bradford, 1976) (17). Kidneys were resected and put into 10% formalin (10, 18). After 24 hours, the fixator solution was changed. After processing, 5 µm sections were prepared using rotary microtome and sections were transferred into gelatin slides. For evaluation of sections, hematoxylin and eosin (H & E) staining was done (Ziess, Germany). In each group, at least 100 glomeruli (20 glomeruli from each rat) were observed and evaluated (10) by a pathologist who was blinded to the treatments. Results were reported as averages and standard deviations. After determining data distribution, one way ANOVA was used for analysis of the histological data. Other parameters were assessed using repeated measure ANOVA and Tukey’s post-test. P value less than 0.05 was considered significant for all analyses. Thirty two male Wistar rats were used for the study. Animal weights were measured one week before the evaluation as well as three and six weeks after evaluation. Results showed that weight does not show any significant difference one week before evaluations in all groups, while there was a significant difference among groups after three and six weeks. After six weeks, diabetic group showed a significant reduction in weight compared to the control group. Although this decrease was also observed after three weeks, it was not significant. Moreover, difference was not significant after three and six weeks between the two groups of diabetic and diabetic under treatment with OM. Although body weight was higher in diabetic group receiving treatment compared to diabetic group without treatment after three and six weeks, the observed difference was not significant. In addition, treatment of control group with OM resulted in a significant difference compared to control group without treatment and weight was less than control group (Figure 1). Regarding renal lipid peroxidation marker, treatment with OM in control group did not produce any significant change versus untreated control group. In contrast, STZ-induced diabetes resulted in significant elevation of MDA content compared to the control group (P = 0.009), and treatment with OM in diabetic group caused a significant reduction of MDA level (P = 0.03) versus untreated diabetics. Meanwhile, OM-treated diabetics did not show a significant elevation of MDA content in comparison with control group (Figure 3). 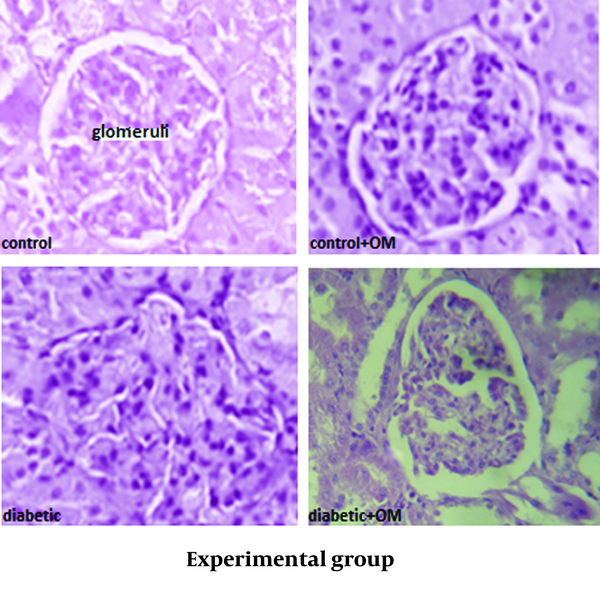 Staining of the renal tissue showed that the glomeruli of the control group were morphologically normal and that the treatment of the control group with OM did not have a clear effect on the structure of the glomeruli. Meanwhile, the glomeruli from the diabetic rats had expansion and dispersion after six weeks, even though such alterations were yet statistically non-significant. 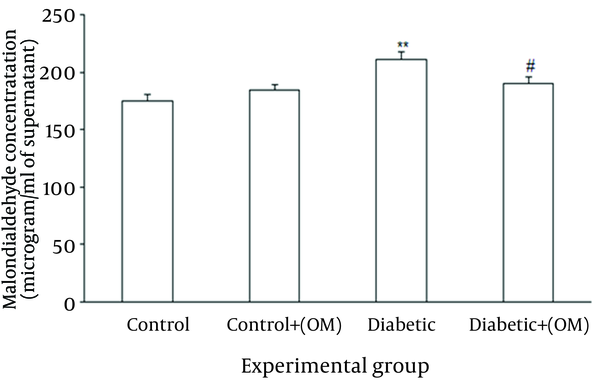 Also, the treatment of the diabetic group with OM non-significantly reduced glomerular size with a more regular pattern (Figure 4) (Table 1). 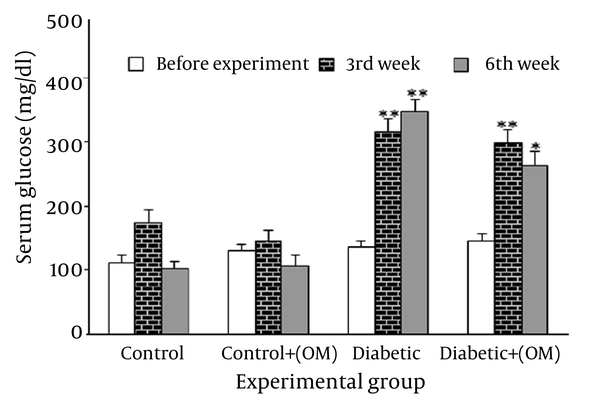 The results of this experiment showed that treatment of the diabetic group with OM does not increase the weight of the diabetic rats, nor does it reduce the serum level of glucose in any significant way. Diabetic rats showed a significant rise in the levels of malondialdehyde in the renal tissue which was significantly reduced after treatment with OM. Furthermore, undergoing treatment with OM for the diabetic rats showed a non-significant reduction of the glomeruli size and their irregularity in shape and pathological expansion. Reports of the previous experimentations show that in both diabetes insipidus and mellitus (respectively type 1 and 2), the occurrence of oxidative stress rises due to increased levels of oxygen free radicals and that the body’s anti-oxidative capabilities are somewhat diminished which is the main cause of tissue damage in diabetic patients (7, 8). The activities of anti-oxidative agents in the body play a major role in the upkeep of cells against internal and external toxic free radicals (8, 19). The STZ-induced diabetes can result in lowered levels of activities of endogenous anti-oxidative enzymes and subsequent tissue degradations (8). In time, the occurrence of oxidative stress and lipid peroxidation is imminent in the diabetic patient, for which the best marker would be the tissue levels of MDA (20). Moreover, chronic hyperglycemia affects the renal tissue, either by direct effect or indirect induction of the damage through hemodynamic alterations, while in such situations, hyperfilteration and microalbuminuria play the most important roles. Such alterations will affect the adjacent resident cells into an abnormal production of cytokines and growth factors which will subsequently facilitate the synthesis of extracellular matrix proteins and the depositions in the glomerular level. Such events will eventually lead to mesangial expansion and glomerular basement thickening (10). It has been previously reported that OM can act in many ways to stack up the free radicals of oxygen (i.e. superoxide), protect the cell against harmful chemical substances (i.e. environmental toxins), reduce lipid peroxidation and protect the liver against a variety of chemically-induced stresses, which can be attributed to its high values of anti-oxidants like flavonoids (21, 22). To this, consumption of this herb can lead to protection of the body’s tissues against the aforementioned harms (22) in the healthy person and the diabetic patient who experience the occurrence of oxidative stress more (20) and show the consequent biochemical changes in the serum. In addition, flavonoids of this herb may balance the enzymatic activities of the liver such ways as to help balance the levels of hormones in the metabolism pathway of carbohydrates like reduction of hepatic phosphorylase and increasing glucokinase and glycogen synthetase, which will in turn, lower the serum level of glucose and maintain a healthy body weight (23). Trials regarding OM have shown that administering the extract of this herb in healthy and diabetic rats will cause a drop in serum glucose levels within six hours of administration, and repeated daily administration will result in a normal serum glucose level (12); though such allegations are inconsistent with our findings in this trial. This contrast might be partially explained by the fact that diabetes has been chemically induced with a cytotoxic substance in our rats, which will cause a more severe set of biochemical effects. Accordingly, the serum level of insulin and the number of insulin-producing cells would reduce to an absolute minimum. Furthermore, in another study, the anti-diabetic properties of OM had been confirmed. The results of this study showed that long-term administration of OM will withhold the organ and tissue damage and this treatment does not affect the serum levels of glucose among animals (13); again, such allegations are inconsistent with our findings. In our study, the increase in renal tissue levels of MDA was documented and oral administration of OM resulted in decreasing the levels of oxidative stress markers in the renal tissue. Correspondingly, some positive attributes of OM in this study may be the ability to lower the oxidative stress. On this matter, it was shown that some flavonoids can boost the activity of some free-radical-fighting mechanisms of anti-oxidants and enzymes (24). Accordingly, flavonoids can lower the occurrence of lipid peroxidation as well (25), which can lead to lower levels of MDA in the renal tissue. Some inconsistencies with other studies can be attributed to the varying dosages of administration of OM, considering that our dosages have been closer to the minimum effective dosage in the diet of the subjects. Also, another cause may be the route of OM administration which was oral in this study. Lower consumed amounts mean lower levels of entry in the blood. We recommend re-assessing the ability of OM in lowering the serum glucose levels and its antioxidant properties with different administration routes or higher dosages. One of our limitations was that we did not measure the Glomerular Filtration Rate (GFR), and we recommend similar studies with GFR measurement to assess the effects of OM on physiological functions of the glomeruli. The authors wish to thank Prof. M. R. Jalali (Pathologist), Mr. H. Nami (Biochemistry Department), Miss. F. Ansari (Physiology Department) Mrs. M. Sharayeli (Pathology Department) (all from Shahed University) for their assistance. Implication for health policy/practice/research/medical education: This manuscript investigates the effect of Origanum majorana as an anti-oxidant on nephropathy in diabetic rats by assessment of malondialdehyde (MDA) concentration and histopathology of kidney tissue. Authors’ Contribution: M. H. Ghosian Moghaddam and I. Ansari designed the study. All authors participated in acquisition of data and doing the trial. M. Roghani and M. Moradi performed the statistical analyses. I. Ansari revised the early draft of manuscript. All authors contributed to interpretation of finding and editing the manuscript. All authors participated in final approval of the article. Financial Disclosure: The authors declare that they have no competence interests. Funding/support: This study is not sponsored and supported by any organization and all expenses are paid by the authors.